I desire clarity, not confusion. Which is why I’m answering some of your questions—right now. But just to be clear, in general, I am a confused person. 1. What exactly is TIP? What is the purpose behind it? Well, this is the mother of all questions, now isn’t it? TIP combines my love of talking about God, relationships, art, music, and FOOD all into one place—it is a six-week DVD series that explores common questions and issues people of my generation face today. Last summer my dad and I sat down in front of an live audience and had a candid conversation about faith, dating, marriage, and male/female relationships. I share my own stories and questions—believing they mirror those of my generation—and my dad provides insight based on his own study and experiences. What resulted was TIP. Each week includes approximately 30 minutes of video, time for discussion, and various suggestions for personal reflection. My greatest hope for this project is that this conversation will inspire more conversations and give you wisdom, or illumination, if you will. While the study can be done with people in similar life stages, ideally I would love for it to be used with singles, dating, engaged, newly married folks that fall into the approximately 18-35 age range, while inviting or initiated by an older person or couple who wants to be available for the younger generation. I want to bridge the gap between generations because I truly believe we have so much to learn from those who’ve gone before us. And I also truly believe that the older generation desires to mentor and create strong connections with the millennial generation but often feels like they aren’t equipped. This is a perfect tool to equip anyone—from the older person who wants to mentor to the younger person who wants to connect with their peers. Get additional details by clicking on “About This Project” on the main page. 2. Is TIP a small group study? 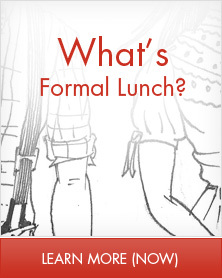 How is it different than just talking with your friends at the dinner table? TIP is a study that is Biblically and scientifically based, but it is also full of personal stories and reflection. Not only from my father and I, but from other artists, writers, and musicians, as well. While it’s not mandatory, I suggest the groups meeting in a home and consider having dinner together. Mostly because I love food, but also because I find that the table is a perfect place for great conversation to happen naturally, as opposed to just diving into a video and then staring awkwardly at each other afterwards. (Although the topics we talk about usually take no time at all for discussion to start!) Think of TIP as just an excuse to have dinner discussions with friends. 3. What lessons are we supposed to gain from the study? 1. Emerson & the Birth of the Crazy Cycle. My dad shares his story of growing up in an unstable home and why that was a catalyst to him wanting to understand men, women, marriage and male and female communication. He also gives an overview of some of the main Love and Respect principles. 2. Joy and the Birth of Love and Respect Now. I share my story of a broken relationship that left me wondering if God was good, if I had hope for marriage and relationships and how that eventually led me to doing what I’m doing now. Both my father and I discuss how our wounds made us want to help heal other peoples wounds. 3. What’s the Difference? I push back on my dad about male and female differences and wondering if they really are that big of a deal anymore. 4. Yeah But What About… is me pushing back on my dad even more and addressing some of the things in his book that, upon first glance, probably don’t make sense to a lot of people in my generation. He answers allll of my questions. 5. Why Marriage? This session looks at the purpose of marriage and what do we do when we are in it and what do we do when we desire it and it doesn’t seem to be anywhere in sight. 6. Q&A. This is a Q&A session we did with the audience where we had NO idea what they were going to ask. After a long evening of non-stop filming with no cuts, you can imagine there was some delirium. The hope is that it sets the stage for your own group to dive into Q&A on their own. *Maybe. Just don’t let me be the gauge for what “success” looks like. 4. Is this a study that people who don’t believe in the Bible can join? Yes, of course! Truth is truth, and I believe each person, regardless of where they are at spiritually, will find things in this series that resonate with them. My hope is that The Illumination Project is designed in a way that will be visually and conceptually appealing to lots of people. I want this project to create a safe, welcoming environment for those who may be wary of the church—because at the end of the day, everyone I’ve ever talked to has opinions about two things: God and relationships. They’re at the core of who we are and what matters to us, regardless of what we believe about them. So at a minimum, TIP will get some great discussions going among you and your friends! 5. How is TIP different from the original Love and Respect DVD series? If I’ve already gone through the original, should I bother with TIP? Yes, you should bother! 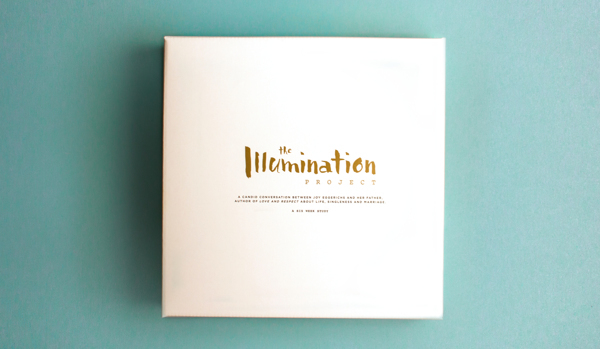 Unlike the Love and Respect DVD series, which focuses heavily on applying the Love and Respect principles in a marriage, The Illumination Project is aimed to reach a broad audience—single, dating, married, divorced, young, old, in-between. It is simply the start of a conversation between two generations about faith, marriage, male/female relationships, and the like. The main Love and Respect principles are the foundation of this series, but not the entire framework. In fact, spoiler alert, I spend a whole video session pushing back on a lot of the principles my dad wrote about in Love and Respect, hoping to gain clarity on some of the more sensitive issues. Another spoiler alert, my dad takes it like a champ. 6. What is the benefit of the box set? While TIP will eventually be available for digital download, you’re really getting bang for your buck by ordering the box set. …and a book of matches to light things on fire. 7. But, what if I don’t want all the extra stuff in the boxed set? Do we really need the journals? The real question is, who wouldn’t want all the extra stuff in the boxed set? The Gold Star Czar pin alone should be reason enough to gather your pennies and buy the box. 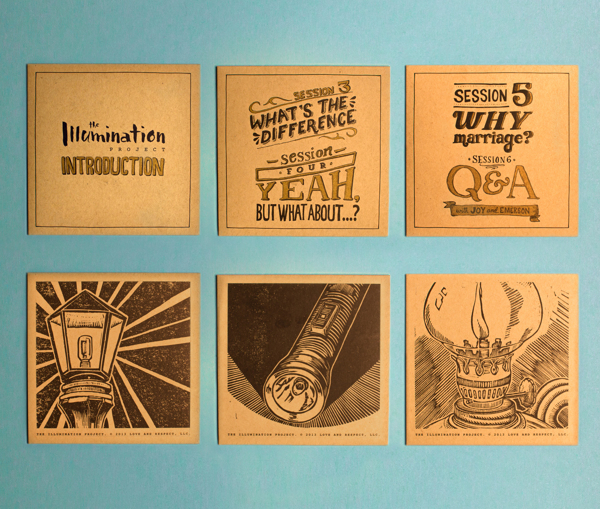 But truly, the journal is a pretty key aspect to The Illumination Project. Even though there will be a digital download option eventually, I really encourage participants to still order the journals. By design, they they will allow the people in your group to go much deeper after each meeting as they answer questions and work through all the wisdom my dad and I have imparted. There will always be people who feel comfortable sharing and processing in a group, but the journals will help those who need that space on their own, too. And financially, buying the journals separately is a good deal! For a mere $15, you get a journal and pack of colored pencils with each. Make everyone in your group skip that small latte and buy some wisdom instead. Tastes just as good (probably). 8. Can TIP only be done in a small group setting? No. TIP is ideally created as a small group study to be done with a diverse group of people, but you can go through the series as a large group in a church (maybe in one long evening or day like when it was filmed live), as a couple, with your peers, or even by yourself. Although, by yourself, the thumb war may be a little anti-climatic. You can check out the Getting Started page for instructions, ideas and things to think about as you, well, get started. You can also find out more about the Thumb War on that page. 9. 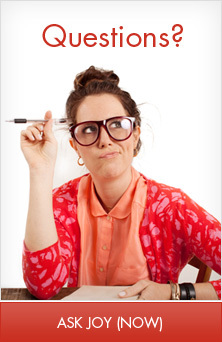 How is TIP different from other small group curriculum? One of my biggest dreams for TIP is that it would be done with a diverse group of people. Usually small groups are done with like-minded people because as humans, we gravitate toward those who are our same age or who are in our same life stage—it is easy to relate and do life with people who are traveling the same path as we are. But in that setting, it is also easy to fall into a “grass-is-greener” effect, becoming bitter or envious of people in other stages. It’s amazing how quickly we lose a sense of empathy and reality toward one another when we aren’t in relationship with them. Regardless of where you are in your journey—single, dating, married, or divorced—I truly believe you have something unique to contribute to this project. We have so much to learn from those walking different paths, and TIP builds on that important idea. 10. Were any unicorns hurt in the making or TIP? Well, that should be good for now. Ask any other TIP questions and I’ll answer your questions in the comments. As promised, I wanted to share this letter from the Love and Respect C.O.O. who had her own “lightbulb moment” while watching the series for the first time. She shot this email off to the rest of the staff, most of whom had not gotten their copy of TIP yet and it was so encouraging to me and my father, that I wanted to share it with you. 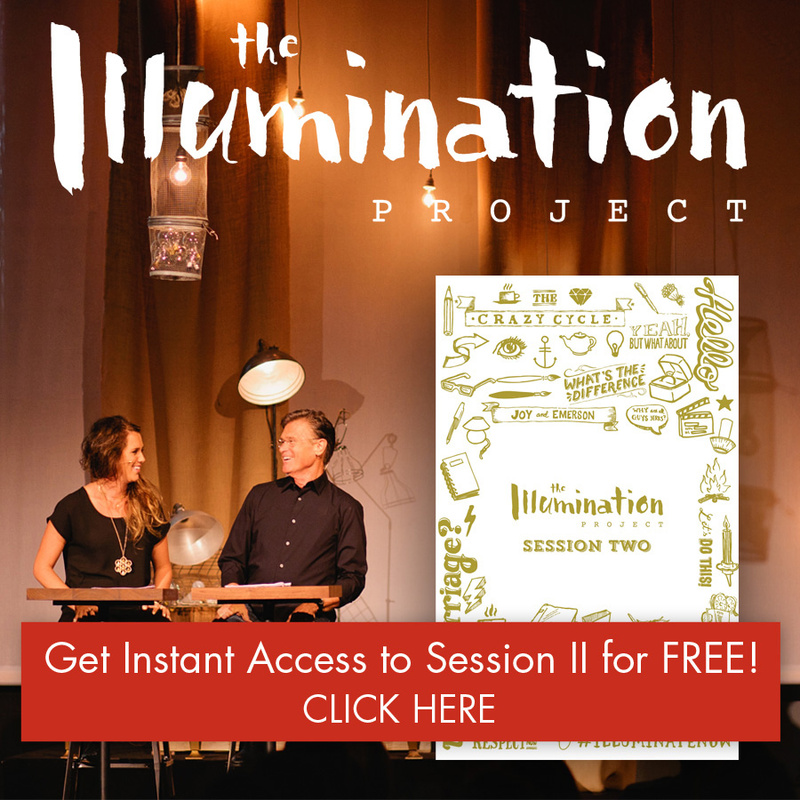 This morning as I worked, I listened to all six sessions of The Illumination Project. It was excellent! 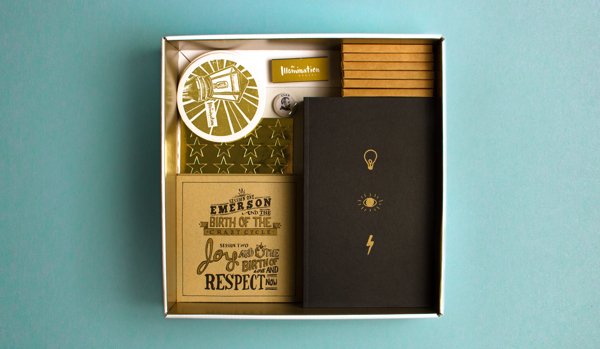 The energy between Emerson and Joy is amazing – they are good together! In watching, I saw how though from two different generations, they share the same passion. TIP is Love and Respect without being Love and Respect. During the process and hearing about TIP, I didn’t totally get what it was going to be. Yup – I had a light bulb moment today … I get it and I am excited about it! I am sending you this note to encourage each of you as a member of the L&R Team, to watch. Hearing the message – seeing how they interact – hearing how the audience responded … it is all something each of you needs to experience so you can better share with others about this product. A number of years ago I mentored a group of young women who were all vet students. I wish TIP would have been around for me to use with them. Designs done by Russell Shaw – Amazing, huh?!? Is there an inexpensive or partial set that can be purchased for a single individual? Good question – there will eventually be a downloadable option to just view the videos, but that’s not going to be available until Love and Respect has a site that can support HD downloads…which we are in the process of getting, but have no definitive date. Sorry! However, the study really is best done with a few others so if you can find six people total who are interested, it comes out to be about $20 a person, which, will be less than the download cost and you get SO much more in the set. 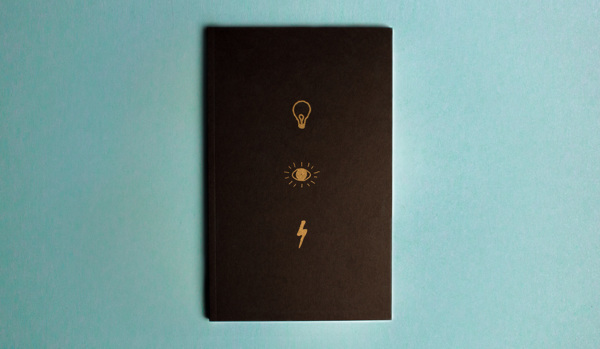 The “Journal” alone has a ton of additional material that you won’t want to miss. It’s available….FOREVER!! But the discount ends after Christmas Day. Thanks Julie!